This is the second part of a multi-part article on how to improve your search engine rankings (SEO) using WebWiz@rd and other methods. My last post was about how to identify what are your main keywords to start the process of making your site more easily found. Part 2 of "How to improve your search engine rankings (SEO) using WebWiz@rd and other methods" will be talking about using meta-tags and, more specifcally, how to do it in WebWiz@rd. Now that you have come up with the list of keywords that you want to be found by, insert a list of 20 – 25 top keywords and a 1 – 2 sentence description describing your business into the meta tag module. You can also use the enhanced, page level meta-tag module to do this for each page within your website. Be descriptive about each page so the search engines can direct users to the specific page they are interested in. Contact us if you would like to have it added to your website. The example below shows what the meta-tag module looks like and how easy it is to update anytime. 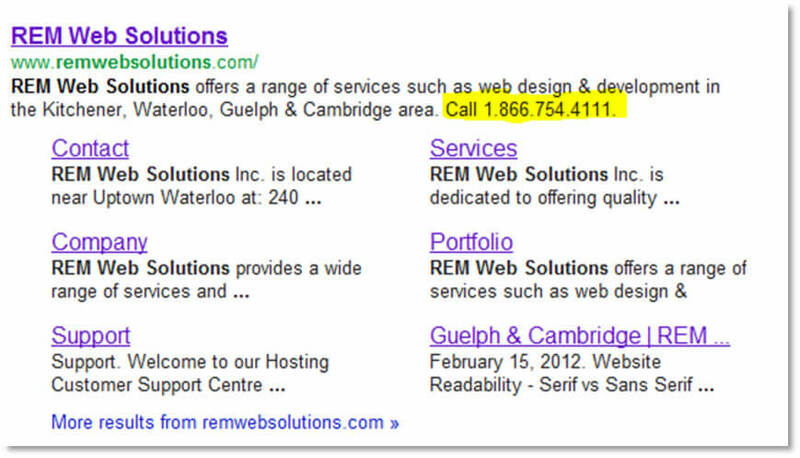 The description is what Google will typically use to display in its search results. Notice how we have inserted our phone number so people are encouraged to call use without even having to click to our website. Stay tuned for our next quarterly newsletter where I will start talking about Alt Tags and Title Tags. Laura Renner is the newest team member at REM Web Solutions. She is responsible for customer invoicing, general office administration, support, and assisting with social media. Laura comes to us with a background in Chemistry and a passion for technology! Education: BSc in Chemistry at Wilfrid Laurier University. Previous Lines of Work: Laboratory technician - though I have recently decided that laboratory work is not what I'd like to do with my life. Something That Makes Me Smile at Work: When all of my coworkers are getting along and can have lots of fun together! One of the Things I Find Fascinating: The human mind. It's so interesting how people can think so differently about things. Web site: Reddit - it's my source for all the world news and things I love! Season: Fall - I love the colours and weather! Place: Public washrooms - Gross! Most People Don’t Know This About Me: I love to shop and I love all things girly (sparkles, Hello Kitty, etc.) but I am really into heavy metal and all things nerdy (gaming, Star Wars, comics, etc.). Lots of people are surprised when they hear me listening to music after seeing me! We are very happy to announce that on October 22, Laura Renner started at REM Web Solutions! We are continuing to roll out our new version of WW 3.2 to exisitng WebWiz@rd clients. If you have not yet been contacted, please be patient as we complete the migration process for each site.